When I walked away from the Posleen Universe after skyrocketing sales and two NYT best sellers, my readers (and my publisher and the sales reps) let out a collective cry of "Oh, John Ringo, No!" To which my response was "Feh. I can't think of any more clever ways to write 'The yellow blood splashed all over the place.' "
But now Mike O'Neal is back! And he's got all new angst, all new problems, new and old enemies and enough anger at the universe for a sentient supernova. 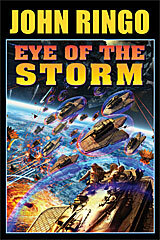 Featuring the return of just about the entire cast from the core Posleen novels (A Hymn Before Battle, Gust Front, When the Devil Dances and Hell's Faire) as well as two collaborative spin-off series, Eye of the Storm starts with a shredding SheVa gun and a blast of antimatter. Then it gets serious.